A pensioner in Benue state has committed suicide leaving a message indicating that he could no longer bear the shame and hardship. State chairman of Local Government Retirees, under the aegis of Coalition of Local Government Retirees, Comrade Michael Vembe, told journalists in Makurdi at the gate of Government House that one of their members, Gabriel Nomishan, from Taraku in Gwer East local government area, had committed suicide last week after attending one of the screening exercises in Makurdi and discovered that there was no money to pay him. 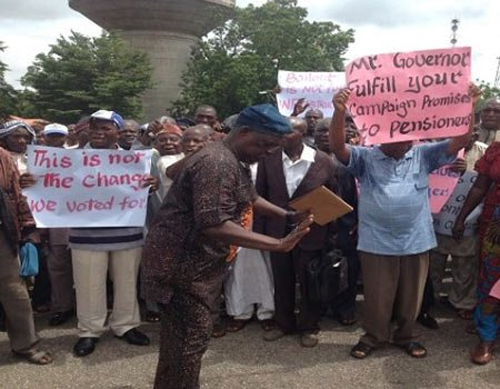 About 2075 retired local government staff on Tuesday stormed the Benue People’s House, Makurdi, insisting that they must take the message of non-payment of pension arrears, amounting N1.1 billion, to Governor Samuel Ortom themselves since all the letters written to him had fallen on deaf ears. Vembe, who alongside his colleagues, spent a night at the gate of the Peoples House, said the retirees had converged at the gate of the Benue People’s House, Makurdi, on Tuesday to seek audience with the governor, but to no avail as they were told that the governor was attending to more pressing state matters. He sent N100, 000 for their fare back home, but they turned it down and slept by the gate. “Today, at about 10am, he drove to the gate and attended to us by directing the Special Adviser on Local Government and Chieftaincy Affairs to list one of us into the Joint Allocation Committee (JAC) with the aim of building confidence in the distribution of resources,” he said. Ortom assured them of his determination to clear all salary and pension arrears and advised them to “go home and wait for what government is doing” for their welfare.